Doctors’ health matters! The Royal Australasian College of Surgeons Support Program is available to RACS Fellows, Trainees, International Medical Graduates (IMGs) and members of their household or immediate family. ﻿﻿CALL FOR ABSTRACTS ADHC 2019. Do you have a passion for doctor health? Join your colleagues and be engaged by speakers, workshops, practical learning sessions and social events in Perth in 2019. Compassion is crucial and yet its importance is sometimes overlooked in our interactions with colleagues. UQ visiting professor and founder of Compassion Focused Therapy speaks with Sarah Kanowski in this ABC Conversations episode. A wonderfully uplifting and insightful episode! Real positivity and inspiration at the #NationalForumDocHealth. Thank you to all that were able to attend. For further information regarding these events contact our Administration Officer. The QDHP is an independent service supported through funding from the Medical Board of Australia. 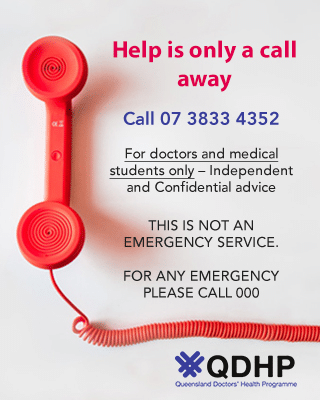 © Queensland Doctors' Health Programme 2018. All Rights Reserved.